Our prototype railways have a lot of situations that "normally" you would think could not have happened in real life but we as modellers do unwittingly anyway. What I am contemplating here is that we collect all our examples and put them in here with a word picture or an actual photo so that the scale rule Richards can be held at bay! I will put in a few examples but unlike the Hints and Tips, feel free to add whatever and whenever. Just keep the number sequence going and I for one am looking forward to your experiences. How many times has someone shown you their unpainted brass locomotive in the past happily hauling a train? It has happened on the prototype where Chicago Burlington and Quincy ran their 4-8-4 5632 painted in a Gold colour for a centenary event in either 1964 or 1965 in Illinois. The prototype in this case followed many models no doubt but it has happened! As I recall, I think Union Pacific also painted a loco in gold, I think a Challenger but as a display piece only. On the evenings of 12, 13 and 16 February 1962, the 6.25pm Hitchin-Huntingdon was hauled by A4 Pacific No.60017 Silver Fox, with the usual two coach load. How many times have you backed an incoming freight into your yard and hit the stop blocks with the brake van, derailing it? (C'mon...be honest!) Well, there is a prototype! In the East Coast Main Line DVD that I previewed recently at time of writing, there is a freight train with the brake van up against the blocks and the front wheels clearly off the road. So...next time you're running an exhibition layout and take some flak from the 'know-it-all-visitor' when you hit the blocks, just say it was done deliberately to recreate an actual event! Two Locos with the same number side by side? Yes it has happened! In 1988 with the visit of Flying Scotsman to Australia, the New South Wales State Rail Authority had a 44 class diesel locomotive also 4472. And yes they were photographed alongside each other while "Scotty" was doing its shakedown runs. There was a story about two Garratts numbered 6042 side by side. The second 6042 was built from parts and recycled bits in 1966/67 and the urban legend extended to the two being pictured side by side at Broadmeadow but as the shopping/outshopping dates do not match it is highly unlikely to have happened... but it could have! There was a picture of 2 boxcars belonging to different railroads Erie and New York Central, both numbered 16634 being coupled to each other in October 68 Trains magazine. South Australian Railways went about a process of Broad Gauging what they called the South east system while still running Narrow Gauge trains. There is a Train order in the book “One Rusty Rail” where Engine Rx201 was to cross T class engine 201 on a Broad Gauge work train vs Narrow Gauge goods train... Normally they would never have had case to meet but it is conceivable that they could have been pictured side by side. From Canadian Railway Observations.. .
http://www.canadianrailwayobservations.com/2010/12/cn2338noname.htm shows a photo of ex CN 2338, now an RPPX leasing co unit and CN 2338 together in McMillan Yard in Toronto in December 2010. An unusual sight at Waterloo on 4 August 1956 was that of the Up Atlantic Coast Express double-headed by 'Merchant Navy' 4-6-2s Nos.35003 Royal Mail and 35030 Elder Dempster Lines. The South Australian Railways rarely doubleheaded its Big Power locomotives but 525 came to the rescue of 524 hauling a train to Adelaide during the Queens visit in 1954 on an up North line train. Also 621 came to the rescue of 620 on an up Passenger when the whistle blew off under pressure in the 1950's... the whistle was eventually found in the smokebox when the loco got back to the depot! Also 621 came to the rescue of 621 on an up Passenger when the whistle blew off under pressure in the 1950's... the whistle was eventually found in the smokebox when the loco got back to the depot! Modellers often report that bits fall off today’s highly detailed models. Well – it is prototypical! On 1 July 1956, the 9.54am Liverpool Street-Cambridge, hauled by K3 61873, pulled up suddenly just as the engine was about to enter Bishopsgate Tunnel. The Fireman went back and rescued the cab door which had fallen off! In a similar incident, on 21 September 1956, the nameplate of Castle 4-6-0 No.5076 Gladiator came adrift whilst heading the ‘The Bristolian’ at speed through Reading. The plate was quickly recovered and sent up to Paddington on the following 11.00am from Penzance (due Paddington 7.10pm). It was handed to its rightful owner prior to departing home at 8.05pm, and stored in 5076’s tender for the journey. It was re-fitted overnight, but, apparently, still showed signs of being in the wars with the beading somewhat buckled. A South Australian Pacific locomotive no 608 had its headlight mount break while hauling the Blue Lake Express in 1955 or 1956. The crew mounted the headlight on the head stock/pilot of the loco and completed their journey. The corner of the cast brass number plate was chipped when it fell off and that chipped number plate stayed with the loco for the rest of its days. And for those overunning the buffer stops. For some months in late 1955 and early 1956, WR coach No.W4611W ran with a roofboard with a town name spelt thus....SRHEWSBURY. A further error was noted in August on coach W8115W bearing a board reading PADDINGTON, OXFORD and WORCSETER. On the railway line between Gawler and Roseworthy on the old South Australian Railways circa 1971, there was an electric signal numbered with a three facing the reverse way... kept the drivers alert late at night when pointing it out to me! In the early 1980s I spent a fair amount of time on Norwich (Thorpe) station. Incoming expresses would arrive, the loco pulling right up to the impressive pneumatic buffers and the loco (usually a Class 47) would uncouple. While this was happening, a station pilot (Class 03, always with a match wagon) would have buffered up to the coaches at the rear. The 03 would then ease the coaches back a few yards, just enough to clear the scissors crossover at the concourse end, via which the train loco would then begin its run round manoeuvring. This hitting the buffers routine was always at extremely slow speed, of course (and I never saw a derailment), but I saw it happen many times. Even all those years ago I was a bit taken aback at how Heath Robinson the arrangement was. Still, it explained why the buffers were so heavy duty! Whacking the buffers in a scenario that features a mixed rake of Mk1s and non air-conditioned Mk2s, Stratford silver-roofed blue 47 and a blue 03 with match wagon is, therefore, entirely prototypical! There were plenty of instances of things like Lowfits, clearly marked "Not to be loaded with containers" carrying containers! A Lowfit is a four-wheeled flat wagon with effectively a single plank surrounding the floor; ideal for containers (of the older style used by the Big Four from the 1930s onwards) made by Bachmann. One can often see advice in the model press saying don't put containers in this or that type of wagon, Lowfits being one of the types mentioned. Unfortunately (or fortunately, depending on your viewpoint! 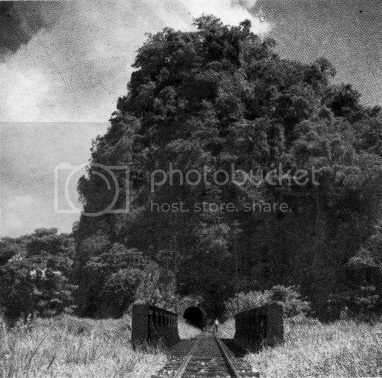 ), railway workers used whatever happened to be convenient, regardless of inscriptions to the contrary! I was an apprentice at Islington in Adelaide in 1973 where there were a few Western Australian Railways vehicles clearly marked “Not to work East of Kalgoorlie” - about 1270 rail miles to the west as the crow flies and a change of gauge (at the time) away!!! Most of the bogie brake vans of the Victorian C, ZLP and SAR/ANR 8300 vans carried radio equipped stickers,above the toilet windows or to the centre of the van concerned. On one occasion in Mount Gambier (in South Australia) I noticed a 8300 class brake van that, had a Victorian Railways radio equipment sticker and on the bottom sill a stencil said “not to run in Victoria” ... go figure. A book about the Yancey Railroad describes some of the day-to-day operations in the WWI and 1920's time period, where they would indeed leave a freight car on the main for unloading by a nearby business, with the understanding that the business was to have the car unloaded or loaded and ready to go by train time tomorrow. 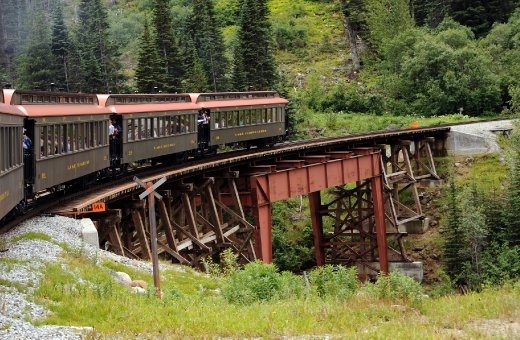 The car to be spotted would be put at the end of the train and just dropped in place and blocked there, then the train the next day would come along and push it back up the line. Clearly, problems were presented if the business did not complete those tasks in time and this did involve the pushing or pulling of the "drop" in front of the locomotive to get it to a place to form the train into a more conventional manner. South Australian Railways had two loco classes, the 800 class of 1956 and the 500 class (1964) both of which did shunting and transfer duties and some mainline duties in South Australia. The 800’s were mechanically similar to the English Electric Class 20’s while the 500’s were a home grown 500HP shunter using EE components, lighter and of 500HP but they could pull more tonnage in some areas than their older cousins and were rated by working timetable to do so. So if one of your smaller locos can handle more than your mainline power, there is at least one prototype I know of! In Australia, there were three bogie exchange centres where vehicles were left intact but gauge changed at those Break of Gauge stations so it was not unknown for a freight car to be for example South Australian with one Yellow Western Australian Railways bogie and a Blue New South Wales Railways bogie. 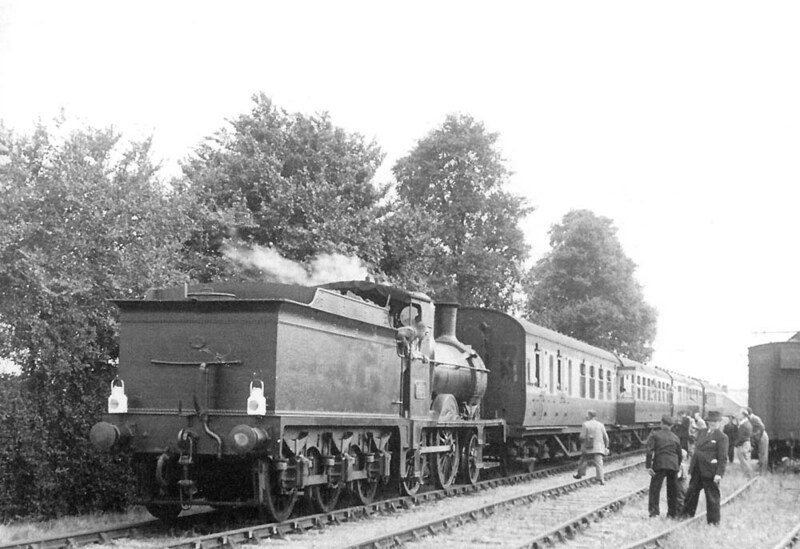 Although the bogies were usually matched pairs. it was also possible for them to be of different types entirely. South Australian Railways had a fleet of Railcars known as “Red Hens” on the suburban network which had two distinctive bogie types. After overhauls, it was common for these cars to have one bogie of each type as they were fully interchangeable. Canadian National had one Budd Car that had outside Disc brakes but it has been photographed with a mix of its regular truck and a standard inside brake truck presumably when maintenance was required. The Southern Aurora was a train jointly owned by the Victorian and New South Wales Railways and two thirds of the cars were fitted with NSW "preferred style" bogies while the VR owned ones had Commonwealth Bogies, the proportion being approximately the proportion of distance covered in either state between Sydney and Melbourne. WANT TO NAME YOUR RAILWAY AFTER YOURSELF? After a number of vehicle train collisions circa 1965, it was mandated that all trains on the South Australian Railways would only be moved with headlights burning so consequently the only time a loco was less its headlights being on was in a maintenance depot, facing another loco when crossing at a passing siding or entering a terminus. It was adopted fairly much Country wide apart from the inner suburbs of Sydney. North American locos also did this as well as using “Mars LIghts”, sort of an ambulance gyra light of red and yellow. Penn Central took one of their magnificent GG1 locos ( a 2-C-C-2 electric) and cut it into a half unit for shop work at their Wilmington shops for snow clearing circa 1969. I saw this unit in the flesh while passing by (incidentally riding in another GG1 on the Washington Bound “Montrealer”). I was a travelling Technician on the Indian Pacific in 1975 between Port Pirie in South Australia and Sydney. It was quite common for NSW 47 and 49 class locos to be attached as trailing units behind Mainline units on this train. On one occasion the 47 class (Caterpillar powered 1000HP units of the time) led the train, more than likely as they were a very smooth riding unit on rough track! Up to about 1972, the Indian Pacific was hauled by 600 and 830 class units (1800 and 950 HP Alco locos) working in tandem together and did so until the arrival of the 700 class diesels in late 1971 where the doubleheading was no longer considered necessary. A friend of mine in New South Wales recorded unit 48165 ( a 950 HP Alco loco similar to the SAR 830 class ) on the front of the Sydney Melbourne Southern Aurora circa mid 1973. I also rode back in my technician days on the Indian Pacific behind a 44 and a 49 class while on one of my weekends off, a 44 and an 830 class on hire to New South Wales worked the Indian Pacific between Parkes and Broken Hill reuniting it with some of its sisters in Broken Hill Loco Depot. Union Pacific did not often double head its’ bigger power, especially Big Boys in the steam era but double heading was not unknown due to power balancing purposes. A friend from long ago witnessed 12 Union Pacific Diesel Locos including a number of their high horsepower unit hauling a Solitary Caboose in the 1960’s, no doubt for similar balancing purposes from one end of the Wasatch Range to the other. South Australian Railways often had to shift power from Pt Pirie to Peterborough 75 miles east as there was more traffic on the Transcontinental line from Sydney to Perth rather than the other way around. One driver in particular hated having dead locos on his trains so it was not unusual for him to have 5 or 6 locos running on his relatively light trains with empties returning to Sydney, 3 or 4 of which were supposed to be dead hauled back to Peterborough. I took a photo of a Victorian Railways triple B class on an up Dimboola passenger in 1981, no doubt a power balancing issue as it was only 4 or 5 passenger cars behind them. A Victorian Enthusiasts Special in the early 1980's triple headed 2 R Class and a D3 class between Bacchus Marsh and Ballan. Really speaking, it seemed only the second loco was powering the whole train! Since that time there have been a number of double, triple and even a quad header train! Where I now live, there is a tourist railway called the Bellarine Peninsula Railway that has locomotives and rolling stock from Tasmania, Western Australia, South Australia and Queensland Railways that would not have met in real life. The main train consists of Tasmanian passenger stock and I have seen it hauled by their ex SAR T class, ex QR PB class and an ex WAGR V class as well as their Tasmanian engines, 3 diesels, 1 steam engine and a couple of railcars. Tasmania did buy a couple of SAR T class in the 1940’s but the others are quite atypical but prototypical! And who said their trains shall not meet? During the Second World War, a number of Norfolk and Western 2-8-8-2’s were sold to Rio Grande as well as Union Pacific Challengers being diverted to the Delaware and Hudson, albeit with detail changes. Western Pacific also owned some 4-8-4’s which were deliberate copies of the famous Southern Pacific 4-8-4’s of the GS class. Queensland Railways had a 1000HP locomotive known as a 1720 class loco. They were often used on the shorter commuter trains in the Brisbane area but were also used on various goods trains as well as being second units on the longer distance passenger trains including the “Lander” trains (Westlander, Midlander, Inlander and Sunlander). 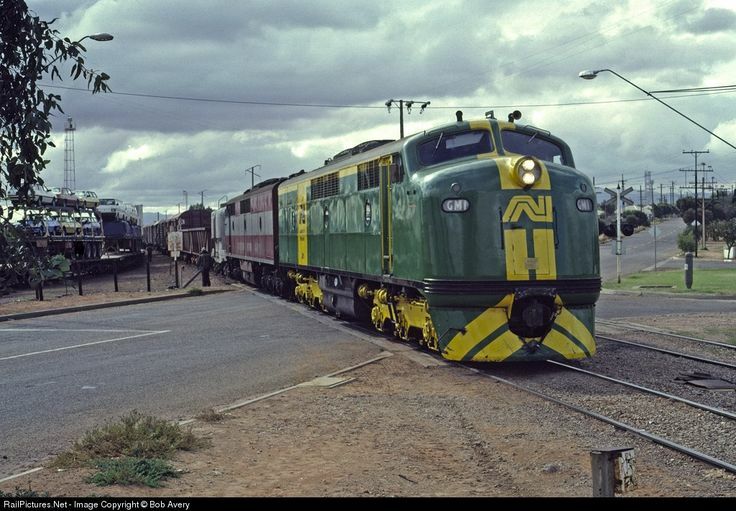 Port Pirie in South Australia was unique in the world until January 1970 when there were three railway gauges meeting of the South Australian Railways Broad Gauge from Adelaide, the SAR Narrow Gauge from Broken Hill and the Commonwealth Railways Standard Gauge from Pt Augusta. When the SAR Broken Hill was standard gauged, South Australia became twice as unique by having Gladstone and Peterborough having triple gauge yards including the worlds only fully triple gauge points/turnouts in Gladstone yards. When the South Australian Railways was modernised in the 1920’s by Commissioner W A Webb, many stations on branchlines were converted to passing sidings so that shunting was quicker and easier in both directions. At stations with very little traffic, the passing siding was the goods siding and any shed on the platform was used to receive less than carload loads but could double as a passing siding in the very rare event that two trains would cross. South Australian Railways had a smallish (by their later standards) 0-4-4T engine known as the K class which in their early days rode roughly going forward and had an undue number of derailments. 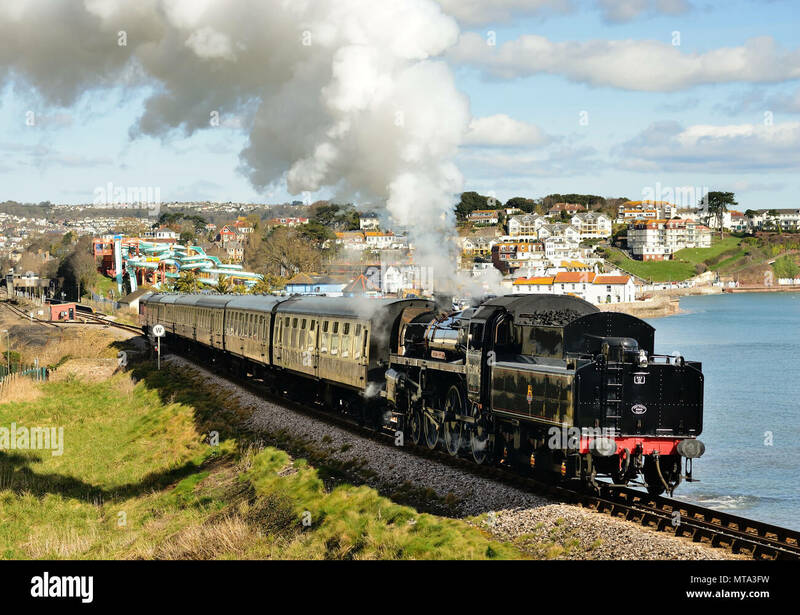 However they apparently rode much better in “reverse” and due to the 4 wheel trailing bogie tracked much better at speed so the edict came from the top that they always be driven with the boiler trailing. The presence of turntables or triangles/wyes at nearly all terminal stations enabled this to be enacted without a problem. During the late 1940’s there was a series of coal miners strikes that affected running steam trains so a number of SAR F class tank engines which were the mainstay of the Adelaide suburban system were converted to oil burning. The oil tank got in the way of the cab roof so a notch was taken out to accommodate the fillers. When the engines were reconverted to coal, the notch was left in situ so it was easy to tell which engines had been converted! In 1972, Southern Pacific ordered and were delivered and number of their SD45 Dash 2 locos. They also had 5 early F series units left on roster and there was a picture in a 1972 trains magazine showing one of each coupled together ready to work a train. Bangor and Aroostook Railway in Maine had a penchant for keeping their old locos running so it was not unusual to see relatively new GP38 locos running with F3 series and BL2 locos, especially when the potato harvest was on. Commonwealth Railways circa 1973/1974 took to hauling their Budd Cars for many services with a GM class locomotive. Boston and Maine also changed their Budd Cars to locomotive hauled cars for commuter service with the Metropolitan Boston Transit Authority. GO transit in Toronto had a fleet of 9 Self propelled single level cars which also became locomotive hauled cars both in Toronto and Boston. Here in Australia, the use of a Guards Van or Cabooses started to become rare occurred circa 1986 a few years after North America. However a number of local trains in the US still use Cabin Cars ( a strange plural of Caboose but there you go) when backing moves are required as well as for work trains. 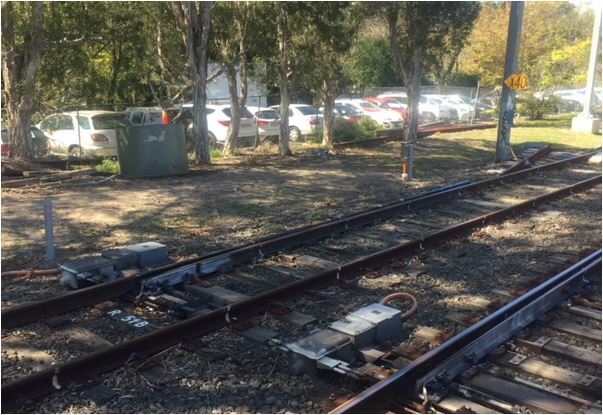 One of the Private operators in Australia has a huge dead end yard that trains in both directions basically back into from a Triangle or Wye track, day in day out. Also trains on the Indiana Harbor Belt Railroad also had a couple of yards which required backing into with long trains and all Long Distance Passenger trains into Chicago’s Union Station back in so that the Locomotives are not under the train shed there. TRAINS COMING OUT OF A STATION THEN BACKING UP TO PROCEED. The South Australian Railways had a timetabled run from the Port Dock Station which proceeded a short distance onto the Dry Creek Loop Line beyond the “Red Hill Junction” before reversing to travel over the Port Adelaide Viaduct, to Outer Harbour and back via the Loop Line to Dry Creek. A single double ended railcar was used for this service. A Similar operating scenario was used for trains on the Liskeard to Looee line in Cornwall. 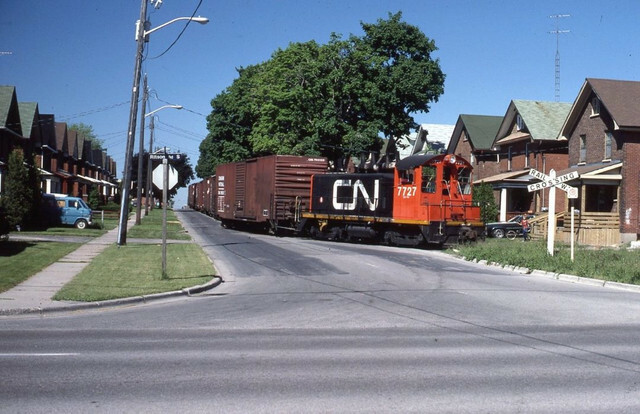 Canadian National gradually built on their fleet of Budd Railcars which all but one had plain rather than fluted front and rear ends. The one exception had fluted ends because it was bought by CN from the Chesapeake and Ohio Railroad and never modified. The ends were painted in CN red but the CN squiggle was placed above the flutes on the left hand side panel (looking at it face on) below the motormans position. South Australian Railways 400 class railcar number 432 had air vents on either end of the roof. It was undecided during construction whether it would be a suburban railcar or a 100 class Bluebird Trailer or possibly even a 250 class Bluebird power car and as all these shared common end tooling and frames, that car could have been any one of those three when it was started. Victorian Railways T class were a disparately built class of locos over a 14 year period where they were similar mechanically but 3 totally different body styles with a high nose. A high cab and a stub nose cab, Furthermore when one had to be rebuilt from what was known as a 2nd series after an accident, it was rebuilt to outwardly resemble a 3rd series loco with the stub nose. Many of us have models of Electric locos and no catenary. Penn Central had to deviate a few trains around a derailment site using the Baltimore and Ohio. The E44 electrics had to lead because of cab signals which would only work for the Penn Central yards and mileage but as they could MU with Diesels, the crews drove the diesels from the Electrics cab. This was for an emergency obviously and the venerable GG1’s were sidelined in that area... and yes there were a few photos! 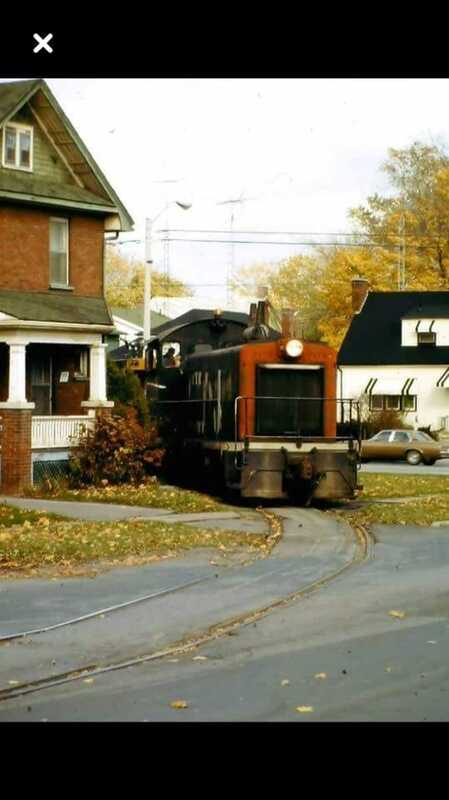 When I was the stores clerk in Cambridge S&T stores we had our own siding which was a back shunt off the oil siding at Coldhams Lane Diesel Depot. When our stores wagons (normally a pair of Vanfits) were being delivered and nothing was to go out the DSL (Diesel Shunting Loco) normally an 08 would fly shunt our wagons - the first we knew of their arrival was a toot toot from the DSL as it trundled back to Cambridge Yard and the wagons rolled past the window, we had to leap out to put the brakes on - if we missed they ended up in a former private siding belonging to Ridgeons the builders. The old BC&DR GWR/WR branch lines had some interesting movements. Shunting the goods shed and the coal wagon siding (as well as the cattle dock) at Hook Norton involved using the first viaduct located at the goods end of the station as a head shunt, repeatedly running on and off, with the guards van usually left in the middle of the viaduct. Running around passenger carriages at Chipping Norton to go back to Kingman in the late 1950's and early 1960's required the locomotive to use the tunnel immediately after the passing loop points as the head shunt. All of the stations on the two lines of the branch line (Banbury to Kingham and Kingham to Cheltenham) originally had station passing loops. The collapse of a cutting at Hook Norton meant passenger service from Kingham ended at Chipping Norton. No turntable at either Chipping North or Kingham at this time so the out or return was usually cold and drafty. British Rail had an Electro Diesel (Class 73?) which had an Auxiliary diesel motor of relatively low power for use in non electrified areas. I believe there are a couple of Italian examples of this type of loco with Pantographs. New Haven (The NYNH&H RR) which merged into Penn Central had a fleet of 60 FL9 locos but these locos were powered by outside third rail. A number of these survived into the 2000’s. The NYC subway has a multi track loop at the foot of Manhattan where they turn the trains to run north again. It is within a few feet of the upper bay. 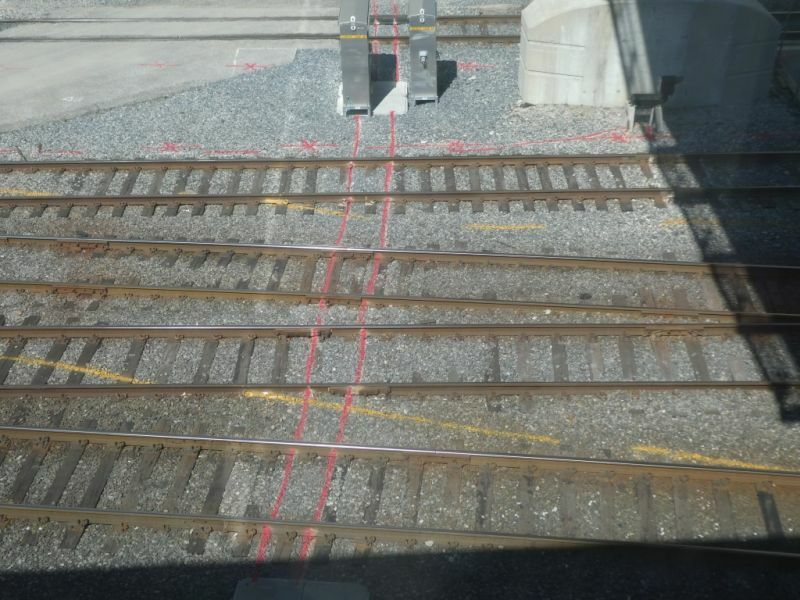 There are also holding tracks alongside the loops. The Brusio spiral viaduct near Brusio, Switzerland. Sure looks like a model railroad scene. Sad, but true that the least used railway station in the UK still having a daily stopping passenger service, saw just 40 passengers last year. That is the case for the once busy station of Redcar British Steel. The station was opened in June 1978 to serve the mighty steel plant, now closed, yet the trains continue to stop daily, excepting Sundays. Comparing these 40 passengers who have no ticket machine, waiting room or toilets, with the annual 94.4 million for the country's busiest station who have a veritable choice of facilities, provides a grand choice for the railway modeller to portray prototype workings in miniature. The possible light at the end of the tunnel though is that the SouthTees Development Company plans to redevelop the steel works site and improve station facilities to cater for the avalanche of passengers. Although the most famous is the Leaning Tower of Pisa, there are many examples of leaning buildings in Italy that my wife and I saw on our first trip there as well as a few leaners in Amsterdam on our second trip to Europe. In Melbourne there is a high rise apartment block that definitely looks offset from about halfway up the building. A DIESEL CONTROL STAND FOR A STEAM LOCO? When I was working at Mile End Diesel Depot in Adelaide, a colleague was servicing a diesel electric loco when a combination of circumstances occurred that the loco started moving under its own battery power when he threw the battery switch on to check a suspect relay. He was quite shaken by the event as there was only just enough air in the reservoir to apply the brakes and bring it to a stop as the brake isolating valve had not been closed. The loco moved about 40-50 metres or so in the process. But there is a prototype for our model locos which are operated purely by electricity with no diesel motor! In the early 1970’s, both the South Australian and Victorian Railways installed CTC (in the Victorian case very gradually) on their Murray Bridge and Western Line respectively. While the conversion was taking place, colour light signals were put in place but were hooded for the most part but often the hoods were not there and signals appeared to be off and trains worked with train orders and staff working. So if your railway has colour light signals similarly in place but not connected ( as mine were for a longer time than I care to admit)... you have an excuse. When some New York and Long Island EMU’s were built in St Louis Missouri, they had to be transported from there to theIr destination to begin their working lives. Hence Penn Central, made a gondola which had a convertor coupler at one end to enable these cars to be taken by train halfway across the country. A semicircular anticlimber was actually fitted above this coupler to match the coupling face of the Long Island Cars in particular. The Crab Apple and Orchard Egyptian Railway in Illinois was steam operated as a common carrier right up until the mid 1980’s. Duluth and North Eastern was operated into the early 1960s with 5 venerable steamers while the Buffalo Creek and Gauley railroad in West Virginia was also operated by steam into the mid 1960’s. This was a terminus, all freight cars and presumably locomotives, entered and left via a transfer bridge from railroad river barges (top right). There were a total of 7 curved 3-way points/turnouts, 6 symmetrical, 1 asymmetrical, 3 are visible to the left off the entrance. All other regular points were curved, as was the scissor/diamond crossing at the back of the building. all were operated by hand-throw levers. All this track work served 17 sidings/transfer tracks, in addition to the double track around the building and the 2 tracks from the bridge. 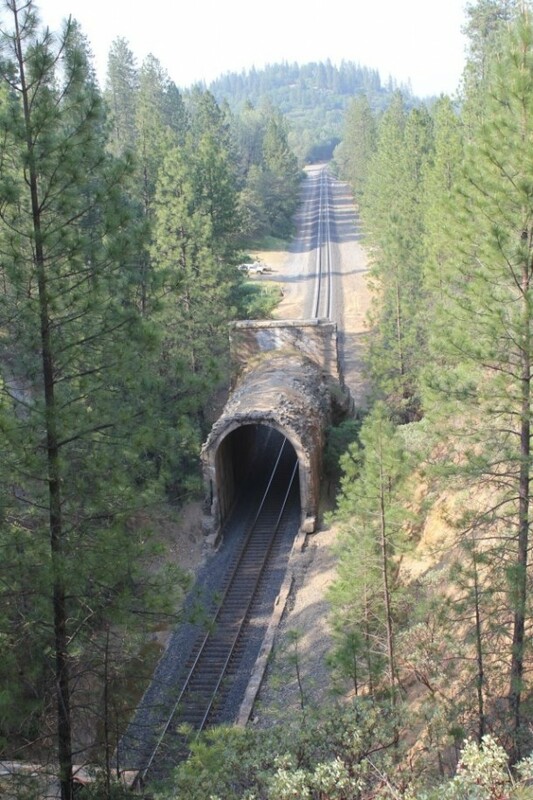 The slip for entering and leaving the inner circle is to the left of the entrance.The depot had 29 sides, all different, and was a not quite symmetrical oval. Most of the freight cars are reefers (refrigerated cars), the ice hatches are visible on the roof. Food or beer in, anything out. The 2 gantry cranes would be for flat car loads. Edit. Engine house over the Harlem river on piles. Accessed by a piece of portable track. Steam 0-4-0 until 1928, small box can diesel afterwards. Locomotives appears to come over with the freight cars from the late 1940's on. Even Tim admits it is a challenge. Lots of attempts to model this. There are some nice paintings of the terminus in action. Just Google!